hile the north meanders down a narrow river valley, giving it its unique viticultural environment, the southern Rhône covers a much greater area, and is extensively planted with vines. The total vineyard area planted in the north is just under 2,700 ha, whereas the total for the whole region is some 75,000 ha and nearly 42,000 ha of that Côtes du Rhône. The climate is altogether warmer in the south and Grenache is the mainstay variety. There can be a significant influence on the region from the cold Mistral wind, which blows down out of the Alps. While it has some influence in the north, it can cause devastation in the south, with not only physical damage to vineyards but stressing of the vines, causing them to shut down. The same Mistral can on occasion help in ripening fruit close to vendange and keeping cellars free of humidity. The most important quality region in the south is Châteauneuf-du-Pape. This is a sizeable appellation with some 3,084 ha of vineyards. Quality has soared in recent very good vintages and an increasing number of growers are now bottling their own wine. The main Châteauneuf variety is Grenache, but there are 13 permitted varieties in the red blend, a number of them white. Syrah and Mourvèdre are also very important in lending structure and grip. The Châteauneuf soils are varied with clay, gravel and stone all playing a role. The larger galets roulés, the famous round stones that store up heat and reflect it onto the vines at night are not universally found throughout the appellation and many consider the clay to be the key component in controlling moisture supply. Among current trends an increasing number of growers are making limited production special cuvées from old vines. While some of these are very splendid wines, there is some question as to whether the quality of the regular bottlings suffers as a consequence. The best red Châteauneuf is rich, heady, almost exotic and very ageworthy. The best will easily continue to improve for a decade or more. The white can be good, floral and nutty and there are some more serious structured wines as well, with oak playing a limited role. In general the whites should be drunk young. To the north and west of Châteauneuf-du-Pape and the ancient Roman town of Orange are the Côtes du Rhône-Villages and the separate appellations of Gigondas and Vacqueyras. The best vineyards of Gigondas are planted on the slopes of the Dentelles de Montmirail, the small range that merges into the hills of the Vaucluse. The wines are dense, massive and brooding. They tend to lack the refinement of the very greatest Châteauneufs, but they can offer not only excellent quality but also value for money. Like Gigondas, Grenache is the most important variety in Vacqueyras, which was awarded its own AC in 1990. The wines are generally lighter than Gigondas and an increasing amount of Syrah is now being used. There are even some varietal wines being produced. The best have an intoxicating combination of ripe dark berry fruit and a marked garrigue character. Three further villages have been upgraded to full appellation status. These are Beaumes de Venise, Vinsobres and Rasteau. There are now 17 villages which can append their names after the Côtes du Rhône-Villages name. Among these are Cairanne and Sablet to the south and Valréas and Saint-Maurice further north where, unsurprisingly, the Syrah is planted with greater success. It is the southern villages, though, and particularly Cairanne, which are producing the greatest number of stylish wines. At their best these express vibrant and complex dark fruit and subtle herbal notes. Those wines produced from old vines can be both excellent value and remarkably impressive. Outside these 16 villages there are several thousand hectares of vines producing straight Côtes du Rhône-Villages. A number of very good wines under both this appellation and the humble Côtes du Rhône label are now being produced. The latter tend to emphasise their forward fruit, but there are also some very serious and ageworthy wines being produced. Some of the better Rhône-Villages domaines may also have vineyards outside the appellation boundaries, or may chose to label younger-vine cuvées as Côtes du Rhône. There are also two regional specialities, which have their own appellations. Muscat de Beaumes de Venise is a floral, grapey fortified Muscat. It is not late harvested and tends to lack the quality found in the Muscat de Rivesaltes wines of the Roussillon. Rasteau Vin Doux Naturel (VDN) is a fortified red vin doux naturel produced from Grenache that can develop marked rancio notes with cask age. This AC should not be confused with Rasteau, where some of the best modern southern reds are being made. To the west of Châteauneuf-du-Pape are the appellations of Lirac and Tavel. The latter is for rosé only, Lirac for both rosé and, of greater importance from a quality point of view, some very good Grenache-based reds planted in the limestone-rich soils. The rosé can often be excessively high in alcohol and dull. Towards the outer extremities of the Rhône are four other appellations. To the north of the Côtes du Rhône-Villages sector, west and east respectively of the River Rhône, are the Côtes du Vivarais and the Côteaux du Tricastin, which since 2010 is known as Grignan-les-Adhémar. 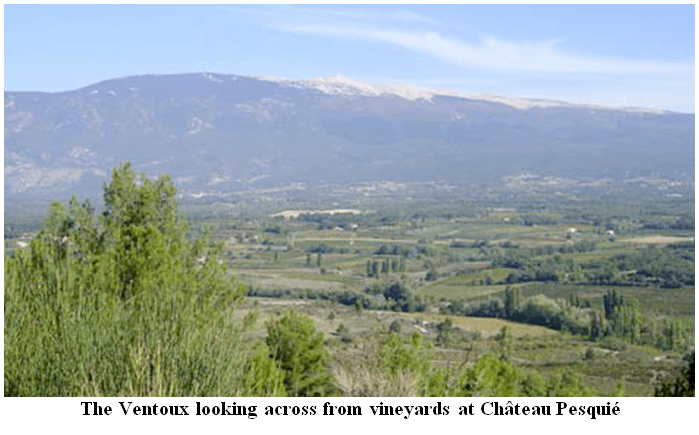 To the south in the Vaucluse are the vineyards of the Ventoux, where encouraging progress is being made by a number of domaines and reds of some substance are being produced. Immediately south again, on the borders of Provence, is the Lubéron. The odd exciting red is beginning to emerge and there are some stylish whites as well. To the far east towards the Alpes some good reds and whites are also emerging from the Côteaux de Pierrevert. There are a number of IGP, now known as IGP (Indication Géographique Protégée) classifications. In the northern Rhône the important one is the IGP des Collines Rhodaniennes, under which some impressive red and white is produced. Two important southern vins de pays offering wines largely based on Grenache (but also Cabernet Sauvignon in the case of the former) are the IGP de la Principauté d’Orange and further south the IGP de Vaucluse. Just to the west of the River Rhône is the emerging region of the Costières de Nîmes. Not surprisingly the wine here has more in common with the blends of the southern Rhône than the rest of the Languedoc and for this reason is covered here. Intense, strawberry-scented, Grenachebased reds are being produced by a number of good domaines and increasing use is being made of Mourvèdre. Many of these properties are also making rich, stylish blends of Cabernet Sauvignon and Syrah, generally labelled as IGP du Gard.